With the start of 2019, McDonald's allowed more local control as to what is and is not on the $1 $2 $3 Dollar Menu. The result is quite a bit of variance to the value menu from location to location. 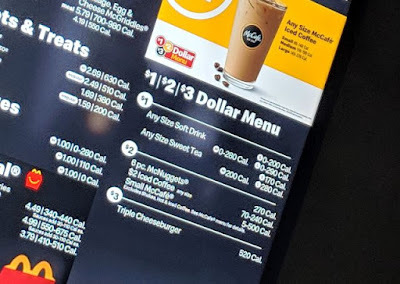 Currently, the only items that are listed on the $1 $2 $3 Dollar Menu at the national level are $1 any size soft drinks, and $2 small specialty McCafe beverages. Back when it was first introduced at the tail end of 2017, the menu had about 11 options. Thanks to the mobile app, you can conveniently take a look at the localized options for most McDonald's and get an idea of how different they can be. As you can see some restaurants have kept on roughly the same menu as before, while other locations have trimmed down or moved around the available items to various degrees (some to the point where it's not really the $1 $2 $3 Dollar Menu as it's missing a whole pricing tier).